During the LightSail test mission, dozens of radio trackers around the world tuned in to our spacecraft's signal. Many of you sent us beacon packets, some of which were very helpful in telling us what our spacecraft was doing when it was out of range of our U.S.-based tracking stations. For our second flight—still tentatively scheduled to launch on a SpaceX Falcon Heavy in Sept. 2016—we'd like to better support and leverage the radio community. 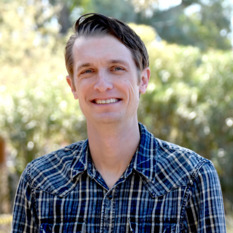 Our ultimate goal is building a software tool that will help LightSail trackers capture and submit data to our packet repository in real-time. Other missions, like the University of Michigan's GRIFEX CubeSat, have done this. Since I'm also a radio newbie, we figured a good initial task would be seeing how hard it was for me to get my own Software Defined Radio (SDR) system up and running, at a relatively low cost, and perform a few basic exercises. In other words, if I can figure it out, I can write how-to guides for everyone else. I can't guarantee success. There is always the risk that you will be out the cost of your equipment and the time invested. Feel free to post questions in the comments, but I don't have the capacity to provide unlimited technical support. Read through all of the instructions first before deciding whether or not to try this on your own. You will be more likely to succeed if you are computer-savvy and have the patience to Google your way out of a problem. The assembly here is straightforward. Connect the Tram antenna to your USB stick using the cable adapter, and plug everything in to your laptop. You'll get better results if you do this from an area relatively clear of obstructions like buildings and trees, with good horizon-to-horizon vistas. For me, this is a nearby park. If you can drive to your location, try sticking the magnetic Tram antenna on the top of your vehicle. Your vehicle's metallic body will become a large ground plane and improve the antenna's reception. I like the simplicity of Cubic SDR, but found it used a lot of processing power and overheated my laptop a couple times. SDR Console requires more initial configuration, but it's feature-rich and uses less overhead, so I've switched to it entirely. 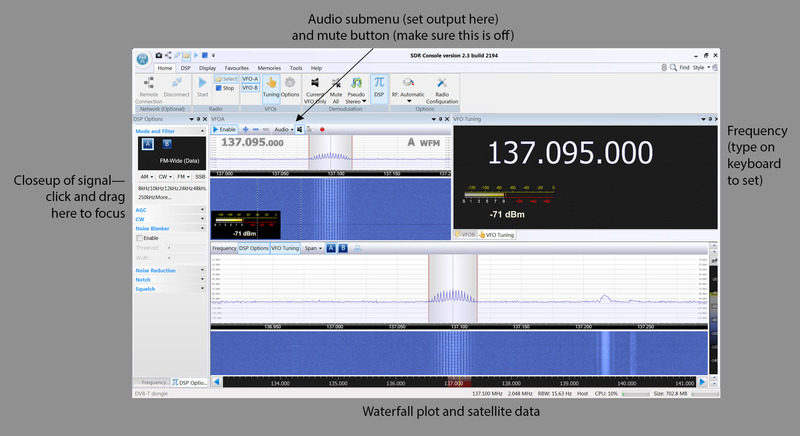 You'll use this software to pipe the satellite's audio signal from your SDR program into WXtoImg. First, install your audio piping program. Both VB-Audio and Soundflower are easy to install. Here's what the end result should look like on either Mac or Windows. On Mac, it's a program that runs in the background; on Windows, you essentially get a new audio device under the recording tab. We'll be telling the SDR software to output to either Soundflower or VB-Audio, while WXtoImg will use Soundflower or VB-Audio as its input. Options > Recording Options: Change your soundcard to either Soundflower or VB-Audio. File > Update Keplers: Do this every few days to download the latest weather satellite position data. File > Satellite Pass List: This shows you the upcoming satellite passes for your location. Pay particular attention to MEL (Maximum Elevation). The higher the MEL, the stronger the signal (90 degrees means the satellite will pass directly overhead). Finally, install your SDR program. I recommend you try CubicSDR first because it's the easiest to configure. And if it doesn't overheat your laptop, great! The lone important setting (besides the satellite frequency, which you'll get from WXtoImg) to change in CubicSDR is Audio Output. Change this to either Soundflower (2ch) or VB-Audio. Beyond that, the program is easy to use. You set the frequency and center frequencies by clicking the top and bottom of each number to cycle up and down (it took me an embarrassingly long time to figure that out). Once the signal appears, click on it and fine-tune your focus using the closeup window in the upper-left. A good bandwidth to start with is 36000 (don't worry, I'll provide a final checklist for everything in a bit). If CubicSDR isn't working for you, give the harder-to-configure (but more feature-rich) SDR Console a try. There are many other programs out there, too. Download Zadig, which allows you to install the latest drivers for your USB stick. In the Zadig console, click Options > List all devices. Select "Bulk-In, Interface (Interface 0)" from the drop-down and click Replace Driver. Run rtl_tcp.exe (you may want to create a desktop shortcut, since you have to run this every time you open SDR Console). A small command prompt window will come up; you can minimize this. Now you're ready to download your first image! Run Soundflower (Mac only; VB-Audio should always be available in Windows). Open your SDR program and verify the audio output is set to either Soundflower or VB-Audio. Tune your SDR to the proper frequency. 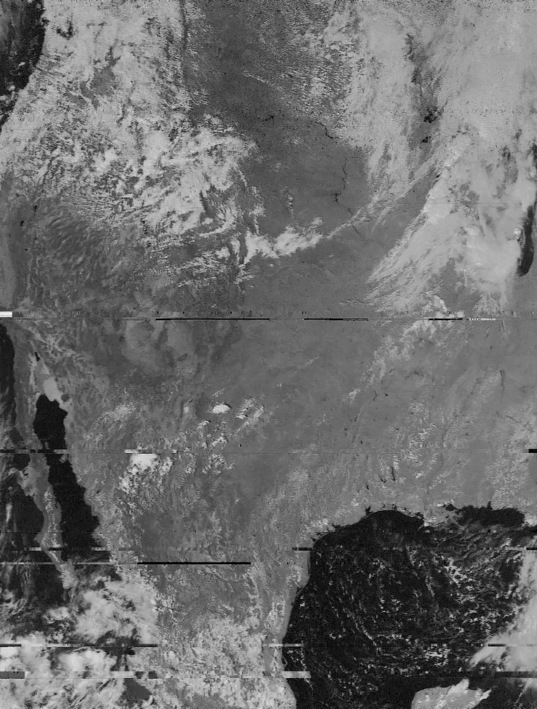 You can find this in the WXtoImg Satellite Pass List. 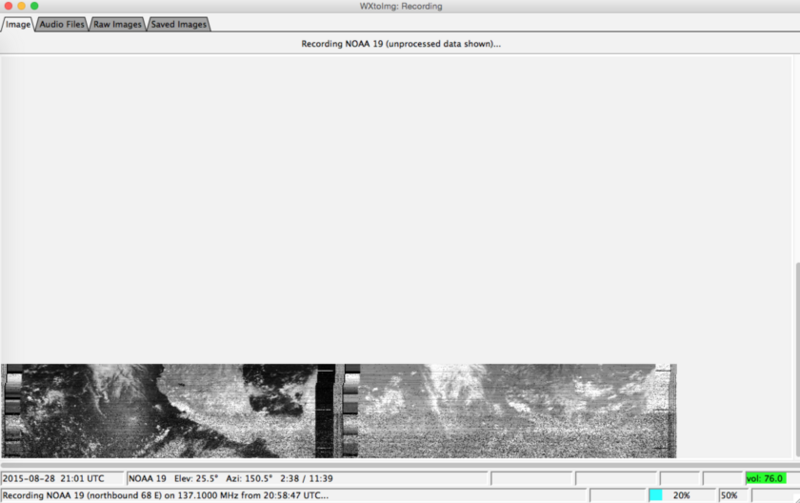 Open WXtoImg and verify the audio input is set to either Soundflower or VB-Audio. In WXtoImg, go to File > Record. Select "Record and auto process," and "Create Image(s)." Click Auto Record. WXtoImg will start recording right on time, but don't expect to see a strong signal on your SDR program yet. The signal will gradually fade in as the satellite moves farther into range. Click the waterfall plot to center on it, and in the zoom window, fine-tune your focus. 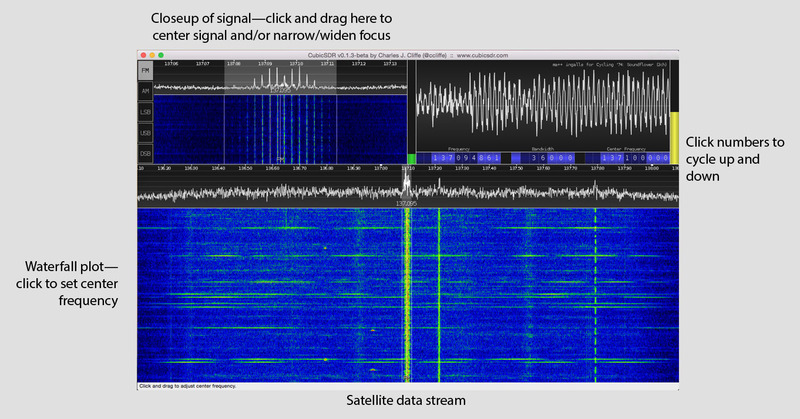 For an example of what the signal looks like, see the above CubicSDR and SDR Console screenshots—both were taken during live passes. Notice how the audio stream you want is actually about a dozen data streams close together in the spectrum. 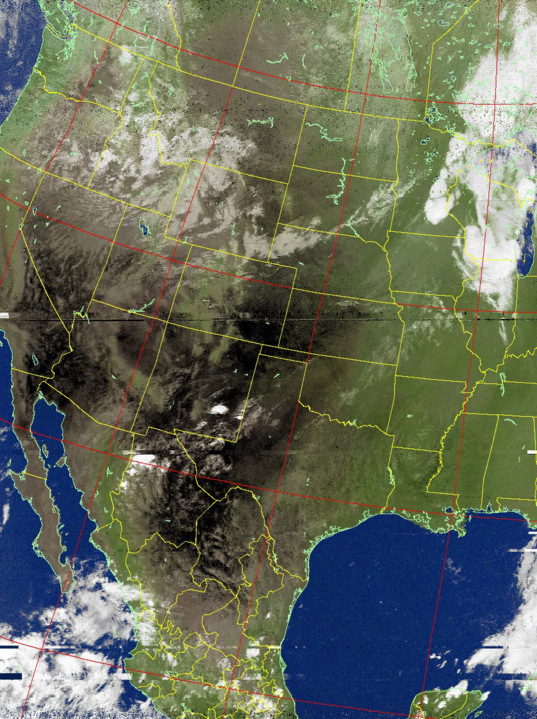 As the signal strength grows, a raw image will start to form from noise in WXtoImg. The image on the left is visible light; the one on the right is infrared. Keep an eye on your SDR program throughout the pass to make sure it stays centered on the signal. Because of the Doppler shift, the signal will shift throughout the pass. And that's it! By default, WXtoImg will process your image in a variety of different modes as soon as the pass is over. You can also click the Raw Images tab to see and reprocess all of your past attempts. Personally, I usually prefer the original black and white visible light image, with no map overlay. It gives me the feeling that I'm a passenger aboard the weather satellite, looking down at myself, the space nerd in the parking lot with a radio antenna on his car roof. This is awesome! I remember doing a project back when I was in school in the late 1970s to receive APT images from polar orbiting weather satellites. Of course back then it was all analog equipment but it was certainly a blast from the past to see a modern, computer-aided version of this classic project. Thanks! Sorry for asking, this might be a silly question, but I'm new to SDR and asking for a European friend ;-) Does this setup also work in Europe (regarding antenna specs, satellite / NOAA coverage etc.)? Are you aware of any modifications that might be needed? Thanks a lot!